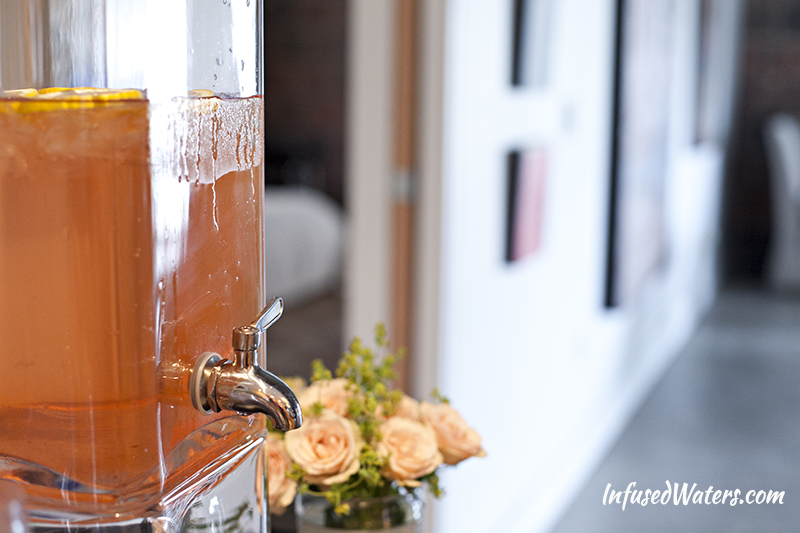 Perfect for parties or weddings, this visually appealing infused water is a crowd-pleaser that you can serve in a large water dispenser without worrying about the fruit clogging the spigot. Because strawberries produce the sweetest, most potent flavor in infused waters, they form the the base of this recipe. Note: you will need to prepare this water in at least four hours in advance and preferably the night before. 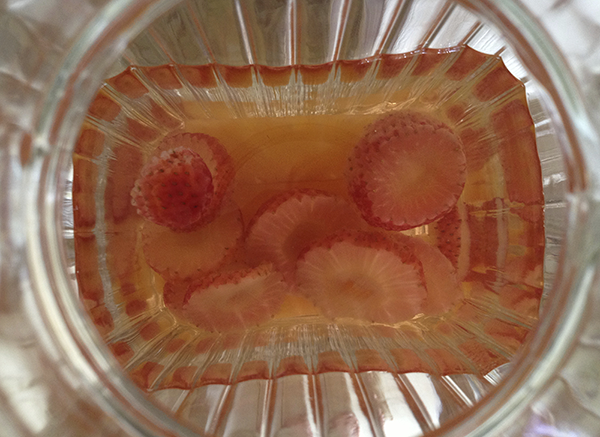 Recipe for a 2.5 to 3 gallon beverage dispenser: 1/2 – 1 carton of strawberries, sliced. You can use a full carton if you are aiming for a very sweet flavor. Add the strawberries and purified water into your beverage dispenser and let the strawberries soak for at least 4 hours or overnight in the fridge. An hour before your event, remove the strawberry slices (they will be pale and “spent” looking). Add 2 organic lemons, sliced. Leave the rind on for this water recipe; lemons slices with the rind look prettier and stay more intact than rindless lemon slices. Because you are adding the lemon just an hour before serving, you do not need to worry about the rind producing an overly bitter flavor. Ten minutes before serving, add ice. The lemon slices and ice will float to the top, leaving your spigot clog-free. Here you can see what strawberry slices look like after being infused overnight. The strawberries’ flavor and color all seep into your water, making the water taste delicious but making the fruit look less-than-great. A special thanks to Tina Sterling for collaborating with me on this recipe for her daughter’s wedding! Thank you so much for the recipe Amy. It was a huge hit! I’m excited to try more. Thanks, Tina! I will try to post more event recipes soon! How many calories do these infused waters have? Hi, Tammie. Infused waters are just fruit flavored waters and have very little calories, especially when compared to commercial fruit juices. I would estimate that an 8 oz glass of any fruit infused water has 5-30 calories at the most. It really depends on the fruits you are using in the water. Sugary, juicy fruits like strawberries or grapes are going to have the most calories where as herbs such as basil and roots such as ginger will have almost no calories. Either way, the amount of calories in infused waters is really small. By consuming plentiful water, you are revving your metabolism and flushing fat out of your body, so drink as much fruit infused water as you can and don’t worry about the extra few calories! I am concerned about calories. My mom does not like drinking water. I’m thinking of trying the infusion but she does have diabetes and that is a huge concern. Also, if I make a large amount of infused water how long will it keep? 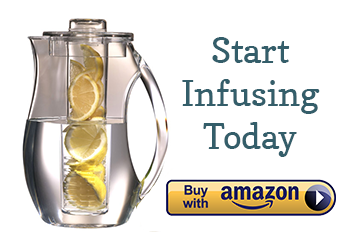 Hi,Amy…this is the first time I know about infused water. So I try your strawberry lemon recipe. Wow can’t stop drinking all day with smile,thank’s. That makes me so happy to hear! Thanks so much for taking the time to comment. I really appreciate it and hope you find some other infused waters that you enjoy. Cheers to your health! Have you tried making “concentrates”? Not much fridge space and large gathering – was thinking of infusing berries in about 1 gal water overnight, then adding the rest of the water and fruit an hour before serving…what do you think? Thank you for this site and all of your recipes! I hosted a baby shower yesterday and all last week I was stressing about what drink I should serve. I wanted something simple and refreshing and I found this recipe. I got lots of compliments on it! The color of the water didn’t change much but the strawberry taste was there (any ideas why it didn’t change?). I will definitely make this again and am eager to try your other recipes. Please keep up the good work! What size of the carton are you referring to? I can buy pints and I can buy 2 lb cartons. Will you clarify for me? Hello 🙂 I am helping a friend with a website for a new catering business. I was wondering if we could use the photo above? Thank you for your consideration.